As a parent, you want your home and the environment to be safe and healthy for your children. There are simple things you can do to help, and many of these will also save you money in the process. Here are 9 useful green living tips for parents. 1.) Recycle old school papers instead of throwing them out. When your children bring home extra papers from school that they no longer need or want, you can recycle them instead of tossing them in the trash. Of course, you’ll want to shred or cut out any parts that contain your children’s personal information before placing them in the recycle bin. 2.) When possible, fix things that break instead of replacing them. If something on a household item or appliance breaks, figure out if there’s any way you or someone else can safely fix it, instead of just purchasing a replacement item. Along those same lines, learning basic sewing skills will make your clothes last longer. Simple things like a button coming off, or a hem coming out can easily be mended in a way that will leave your family’s clothing looking presentable once fixed. 3.) Donate, give away, or repurpose your children’s old clothes. When it comes to old clothing that no longer fits your kids, you can donate them or give them away if they are still in good condition (unless you have younger children you want them passed down to.) Some thrift stores will even give you cash for certain brands of gently used children’s clothing. If you have old clothes that are no longer presentable, you can repurpose some or all of them into a craft or quilt, and/or use old clothing for things such as cleaning- to soak up spills, cut it up into rags for dusting, and so on. 4.) Buy or make your own natural cleaning sprays. You can avoid having your children come into contact with harsh chemicals by making your own cleaners or purchasing ones made with natural ingredients. If you want to make green cleaning products yourself, but don’t know how you can easily do an online search for just about any type of cleaner you need. Search engines like Google or Pinterest are great tools to research natural cleaning sprays and tips. 5.) Spend time with your kids making baked goods from scratch. Instead of always purchasing prepackaged bread, pie crusts, pizza dough, cookies, and the like, turn baking into a family activity when you can. This brings less packaging materials into your home that would need to be disposed of and often saves your family money. 6.) Turn off the television and electronics at a designated time and do family activities. Having a set time to take a break from electronics will prevent your family from having the habit of keeping them running nonstop. It saves energy and also gives your family time to spend together where you can be completely focused on one another. Play outside, play a board game, read a book, try out a (safe) science experiment, and/or find new activities to do together. As a parent, you can teach your kids to be efficient, to recycle, and to use resources wisely. The remaining tips in this article are things you can teach your children that will benefit them as they grow up and contribute to a greener environment. 8.) Teach your kids about recycling and how to do it. 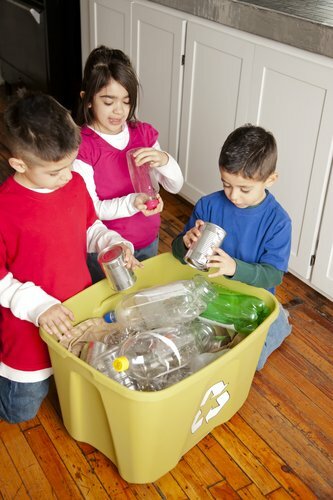 You can teach your kids which household items/containers can be recycled. Show them how to rinse out and recycle different materials. Recycling shouldn’t have to be boring for your kids either. You can turn it into a game, by having a friendly competition of who can recycle the most for a week. Additionally, you can work together as a family to see if you can find ways to by using greener alternatives to the type of things you’re tossing out. 9.) Help your kids develop the habit of making thorough use of everything they have. Show your kids how to use an entire tissue before tossing it and grabbing another. If your kids get full before they finish the food on their plate, show them how to cover and refrigerate their leftovers to eat later, instead of tossing the last few bites in the trash. Teach your kids to take care of their belongings so they last longer. 10.) Check if your children’s school participates in any recycling programs or events. Talk with your children’s teachers and school staff to see what they do to encourage green living for their students. Kids often enjoy participating in these types of programs, and it can benefit them, their school, and others. These are 9 useful green living tips for parents. By thinking ahead, researching, and involving your kids, you can find ways to make your home a little more green. In the process, you will be helping your kids, the environment, and you’ll most likely save some money too.